There will be two figure drawing sessions, each approximately 3 hours long. The first will focus on short poses, and the second will be one long pose. Artists may choose to work in any medium, the sessions will take place in the village gardens with a professional figure model. Monotype is a type of printmaking made by drawing or painting on a smooth, non-absorbent surface before transferring the image to paper with the use of a pin press. We will experiment with working both additively and reductively with oil based inks. The first session will consist of instruction and demonstration, the second session will consist of studio time for the students to work on their prints. Materials will be provided. Students will explore the essential techniques of mokuhanga, the Japanese woodcut technique of ukiyo-e, the "floating world." The first session will cover planning and carving techniques, with the second session dedicated to printing. 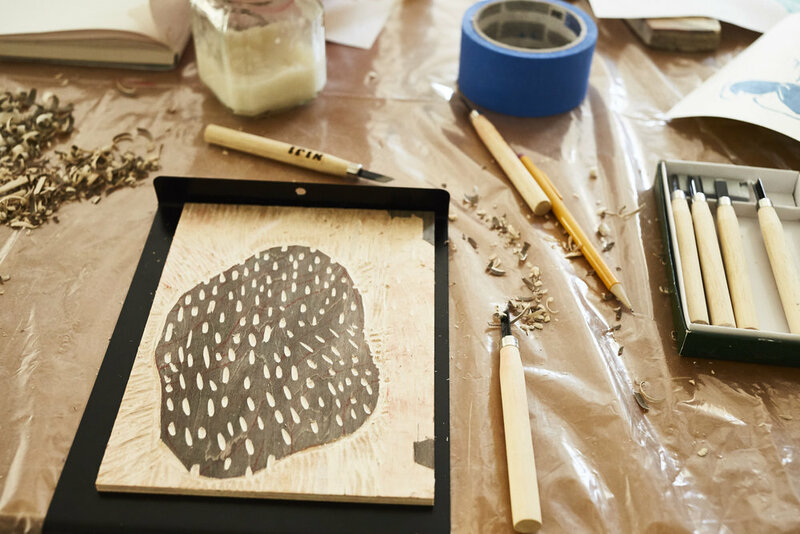 Learn the kento registration system, carving techniques, preparing a drawing for carving, coordinating among multiple blocks to develop a complex print, and using oil based inks to achieve painterly effects. Materials will be provided. We will begin by driving to the working monastery at Toplou, where we will see the icon paintings and etchings from the 15th century. We will continue on to the coastal village of Mochlos, where we will spend the afternoon swimming and sketching. Late afternoon we will charter a small boat to the island of Mochlos, where we will visit the ruins of the Minoan city. We will watch the sun set over the island and enjoy a group dinner at a fantastic seaside taverna. Artists who wish to may swim the half mile to the island or back if they choose. We will return to Agios Ioannis by car after dinner. We will be hiking from our village of Agios Ioannis west over the mountain pass towards the village of Monastiraki. It is approximately a three hour hike, during which time we will be crossing goat grazing lands and olive tree orchards and witnessing the vantage point from which we can see both the northern and southern coastlines of Crete. We will leave at approximately 6pm in order to make it back to Agios Ioannis by sun down. The hike does include some uphill walking, and requires sturdy footwear (hiking boots or tennis shoes recommended) and everyone must carry their own water. Photo ops abound. We will be driving to the unique coastal village of Makry Giallos, where artists may wish to visit locally owned shops, and then spending the afternoon at the nearby “Green Beach”, one of the most beautiful beaches on Southern Crete. After sundown we will convene for dinner at the seaside Kaliotzina taverna.